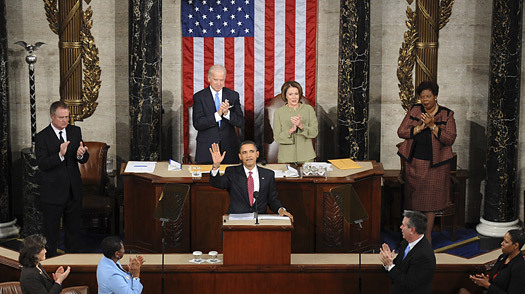 President Obama’s speech to a joint session of Congress may be one of the best political speeches of the last few decades. It will certainly be remembered for its cadence, passion, and a degree of astute articulation which has been missing from the national debate recently. What the speech did lay out is a road map for getting the economy back in shape and then keeping it expanding. What it did not do, despite its own claims, was say how it would be paid for. The jury will be out for a long time about whether the federal government’s plan to stimulate the economy and save banks will work. The very earliest indications will be if job loss begins to decelerate in the second half of this year and banks free up credit to consumers and businesses. If this is not interrupted by more trouble in the financial system or problems in large economies abroad, it may be successful. In terms of paying for the packages, the president offered two major plans. The first was to increase taxes on those who make more than $250,000 a year. The second was to cut spending in Iraq. The two challenges to the success of those tactics depend on how many U.S. citizens who are rich become poor due to the recession and how much military effort will have to be switched to Afghanistan. It would be premature to make a forecast about either. The president also said that his advisers had found $2 trillion in spending planned over the next decade which is unnecessary. The Congress may not view it that way, but, even if everyone is in agreement, a spending reduction of $200 billion or $300 billion a year over the next two or three years will not make a substantial enough dent in the deficit to bring it down by half. The most perilous assumption about driving down the budget deficit is that, if the number of people out of work over the next two years moves up to the level where unemployment stays above 10% for any period of time, tax revenue into the Treasury will be so badly impaired that cutting costs in some large programs will not be able to make up for it. Paying for the plan to save the economy may work, if the economy reacts just as the Administration thinks it will. But, the chance of that is like making a basket at the buzzer from mid-court. See pictures of Barack Obama’s family tree.